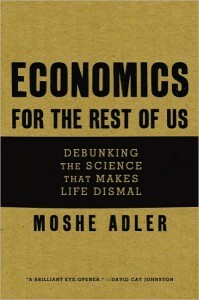 The Economics Anti-Textbook: Moshe Adler's "Economics for the Rest of Us: Debunking the Science that Makes Life Dismal"
Moshe Adler's "Economics for the Rest of Us: Debunking the Science that Makes Life Dismal"
Anyone having a look at this Economics Anti-Textbook blog will want to have a look at Economics for the Rest of Us: Debunking the Science that Makes Life Dismal by Moshe Adler, an elegantly-written and accessible book (as well as being very nicely produced). It can be read by someone even without introductory economics, but can be read with profit by anyone. You can have a preview by looking it up at Google books: http://books.google.ca/books. You'll see that it is divided into two parts. The first examines the concept of economic efficiency that dominates the textbooks in a way that I found very original and insightful. The second half of the book is a critical examination of theories about the most important prices in the economy (wages) which get the back-of-the-bus treatment in the theory textbooks, which spend much more time on output prices.